Why are gas prices so high? The basics of Supply and Demand. - FreeEconHelp.com, Learning Economics... Solved! 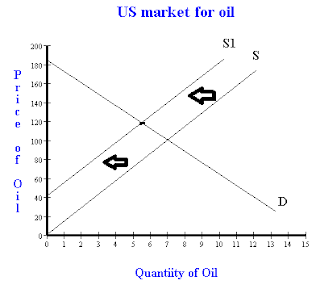 Home econ help equilibrium market microeconomics news supply and demand Why are gas prices so high? The basics of Supply and Demand. Why are gas prices so high? 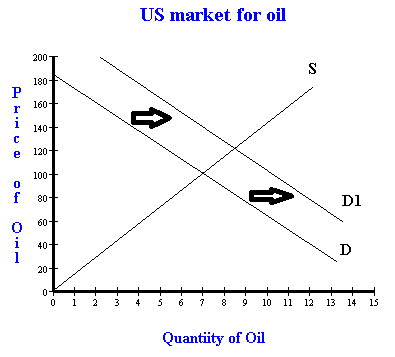 The basics of Supply and Demand. Everyone is feeling the pinch of high gas prices, but what is the cause? People blame the middle east, claiming that OPEC (Organization of the Petroleum Exporting Countries) is limiting production. Others blame the speculators, saying that they are investing money into oil that they never plan on buying which is increasing prices. And finally, some blame developing countries like China, India and Brazil for increasing the demand of oil, making the price go up. No one really knows what is causing the volatility of prices, but each of these examples do play a role. 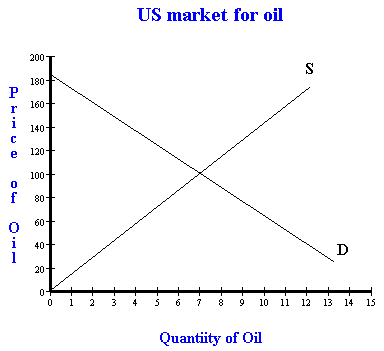 Let’s begin with a simple supply and demand graph for the World market of gasoline (or oil). On our Y axis we have the price of oil, and on the X axis, the quantity of oil. We can set our equilibrium quantity will be set at around 7 million barrels/day and the equilibrium price at $100. 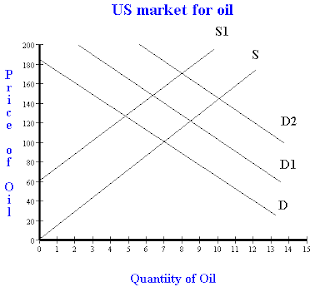 Here the S curve is for supply of oil, and D is for the demand of oil (remember, d is for down, we don’t like upward sloping demand curves). Or we could interpret how the introduction of spectators (or more spectators) could affect the market. Here the main cause for a shift in demand would be an increase in the number of buyers. Because there are now more buyers in the market, we would see an increase in demand (or a rightward shift). This is represented by a shift from D to D1. As you can see in the graph below, the increase in the amount of spectators causes equilibrium price and equilibrium quantity to rise. So now you understand how basic economics can be used to explain the high and growing higher prices of gas.